Arlington, VA, January 14, 2016 – With the highly anticipated premiere of the new Civil War-era drama series MERCY STREET this Sunday, January 17 at 10 p.m. ET on PBS stations, PBS LearningMedia announced today the introduction of a special collection of videos from the PBS Digital Studios series THE GOOD STUFF. 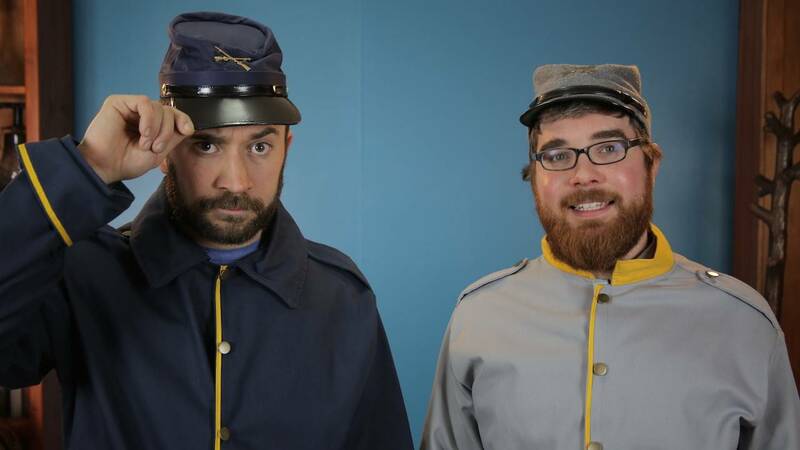 Hosted by YouTube sensation Wheezy Waiter (Craig Benzine) and friend Matt Weber, the new Civil War-inspired episodes, THE GOOD STUFF – TIME CAPSULE, will premiere Friday, January 15, and a new installment will be distributed each week for seven consecutive weeks. Each episode will be available on YouTube and PBS LearningMedia, the media-on-demand service for educators that serves more than 1.8 million users across the country, with additional contextualization for in-classroom use. Targeting middle and high school students, each show (5-7 minutes each) is designed to correspond to MERCY STREET’s themes while framing topics in social studies and U.S. history in engaging, energetic presentations that emphasize the relevance of this history to contemporary issues, extending the educational value of the show into classrooms and homes nationwide. Sourcing from both archival imagery and on-location interviews, THE GOOD STUFF – TIME CAPSULE creates a narrative between different eras in history to build a comprehensive perspective on an issue or theme. PBS member station WNET will create several curricular packages, drawing together excerpts from MERCY STREET and THE GOOD STUFF – TIME CAPSULE webisodes with teacher support materials that include activities, discussion questions, teaching tips and relevant vocabulary. All resources will be available in a special Civil War resource collection on the PBS LearningMedia website. • News Media in Wartime – What if the Civil War were Tweeted? This episode looks at how the news media reports on wars by looking at modern-day war reporting, the techniques utilized and the problems that must be overcome. Much of today’s war reporting can be traced back to developments during the reporting of the Civil War. With expert John Powell, the Newseum’s exhibits writer, we learn that the Civil War was one of the first major conflicts extensively covered using contemporary reporting techniques and technologies. • Confederate Iconography – A look at how the image of the Confederate flag has changed from the Civil War to the present day. Filmed at the American Civil War Museum in Richmond, Virginia. • Spying and Government Surveillance – An examination of the current ways that government uses surveillance to track its enemies and to spy on its own citizens, showing the parallels between the use of present-day surveillance strategies and techniques used to intercept telegraphs during the Civil War. • Innovations in Medical Technologies – A look at modern medicine and its ties to innovations made in the Civil War with a comparison of the modern experience of being treated medically to that of before and during the Civil War. The episode also looks at how advances made during the Civil War have endpoints in the medical practices of today. • Women’s Roles in Wartime – This episode will focus on women’s participation in efforts surrounding the Civil War and how their participation challenged gender roles and opened up possibilities for women’s roles in war in ways we feel today. • Social Movements – A look at the importance of the abolitionist movement in the Civil War era, focusing on parallels between this movement and social movements today. • Evolution of Government/Civilian Relationships – The precursors for many of the government programs and services we enjoy today got their start during the Civil War. This episode offers a look at the power of the federal government and how expectations of the government have changed since the Civil War. Set in Virginia in the spring of 1862, MERCY STREET follows the lives of two volunteer nurses on opposite sides of the conflict: Mary Phinney (Mary Elizabeth Winstead), a staunch New England abolitionist, and Emma Green (Hannah James), a naive young Confederate belle. The two collide at Mansion House, the Green family’s luxury hotel that has been taken over and transformed into a Union Army Hospital in Alexandria, a border town between North and South and the longest-occupied Confederate city of the war. Ruled under martial law, Alexandria is now the melting pot of the region, filled with civilians, female volunteers, doctors, soldiers, including wounded soldiers from both sides, free blacks, enslaved and contraband (escaped slaves living behind Union lines) African Americans, prostitutes, speculators and spies. Other digital assets available online include an expanded interactive character hub with each of the 18 MERCY STREET principal cast members; tintype image generators incorporating one or more user images into a MERCY STREET-themed collage to share on social channels; behind-the-scenes video interviews with crew and photo galleries of props, costumes and sets from the series; and a story series highlighting some of the real-life key people and places. PBS Digital Studios produces high-quality original content for digital platforms with a PBS sensibility. Today, PBS Digital Studios produces and distributes more than 30 web-original series, all with same quality content audiences have grown to know and expect from PBS but created for a YouTube audience. As America’s largest classroom, PBS offers digital content and services for teachers of children from pre-K through 12th grade that help bring classroom lessons to life. PBS LearningMedia, a partnership of PBS and WGBH Educational Foundation, is a free and paid media-on-demand service offering educators access to the best of public media and delivers research-based, classroom-ready digital learning experiences to engage students in exploring curriculum concepts that align with National and Common Core State Standards. Nationwide, more than 1.8 million educators and users have registered access to more than 100,000 digital resources available through PBS LearningMedia. More information about PBS LearningMedia is available at www.pbslearningmedia.org or by following PBS LearningMedia on Twitter and Facebook. The PBS Digital Studios network on YouTube includes more than 30 online original series, including more than a dozen co-productions with PBS member stations across the country. This digital-first programming is designed to engage, enlighten and entertain online audiences. The PBS Digital Studios network has more than six million subscribers, and its channels have generated more than 450 million views. Series include the multiple Webby Award-winning PBS Idea Channel, as well as popular series such as Blank on Blank, It’s Okay To Be Smart, Space Time and more.